...any other improvements you'd like from your bike? 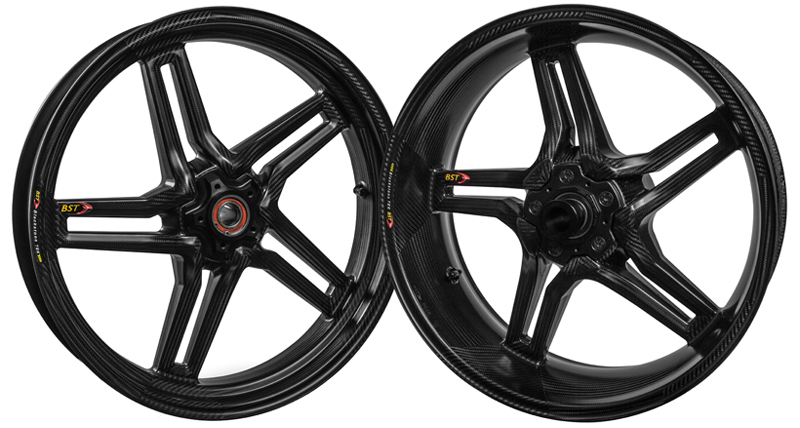 The all carbon fibre motorcycle wheel from BlackStone Tek, produced using the latest technology, materials and aerospace manufacturing processes - in a single moulding process for seamless strength. Comfortably over-engineered for road certification, including TÜV, their extremely light and exceedingly strong design makes them suitable for both racing and street/road use and they make an immediate and immense difference to any bike. "...the ZX-10R feels lika a totally different bike, its responsiveness has gone through the roof..."
“...there is no other mod that can save 2 seconds a lap instantly, even for the same money..."
 Attractiveness - lacquered woven finish gives the wheels a killer look! 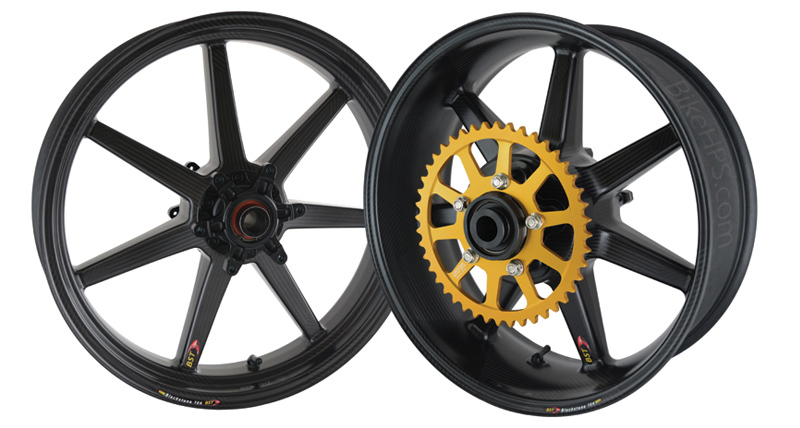 BST wheels are up to 30% lighter than most of today's advanced motorbike racing wheels, and even more significantly lighter than the standard production wheels. Since the weight saving comes from the spokes and the rim, the mass of the wheel is concentrated in the hub to the benefit of rotational inertia. 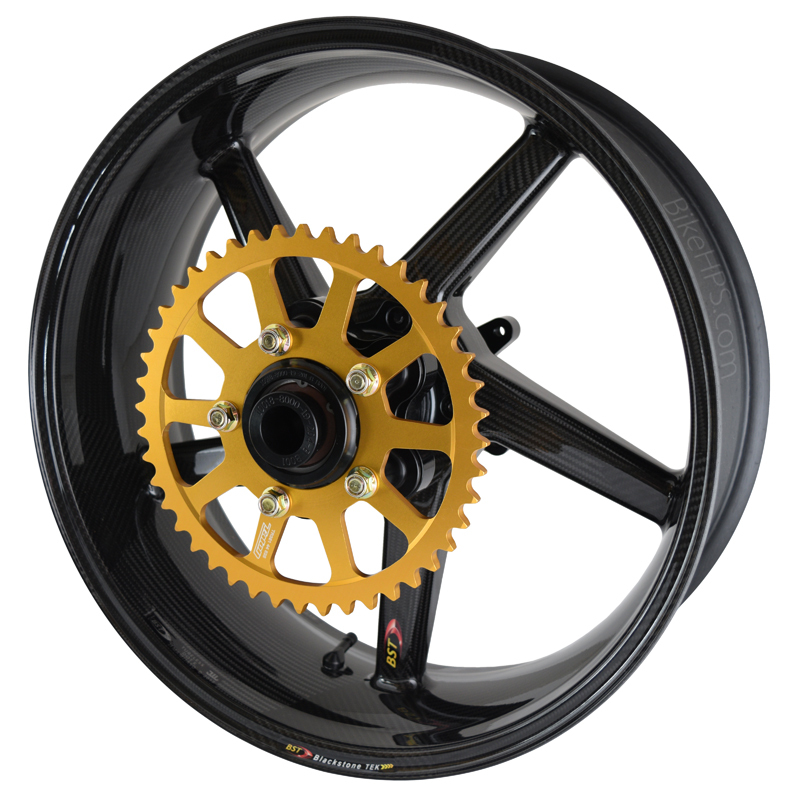 Because these wheels offer a substantial reduction in flywheel and gyroscopic effects, the motorcycle can accelerate, corner and brake faster. 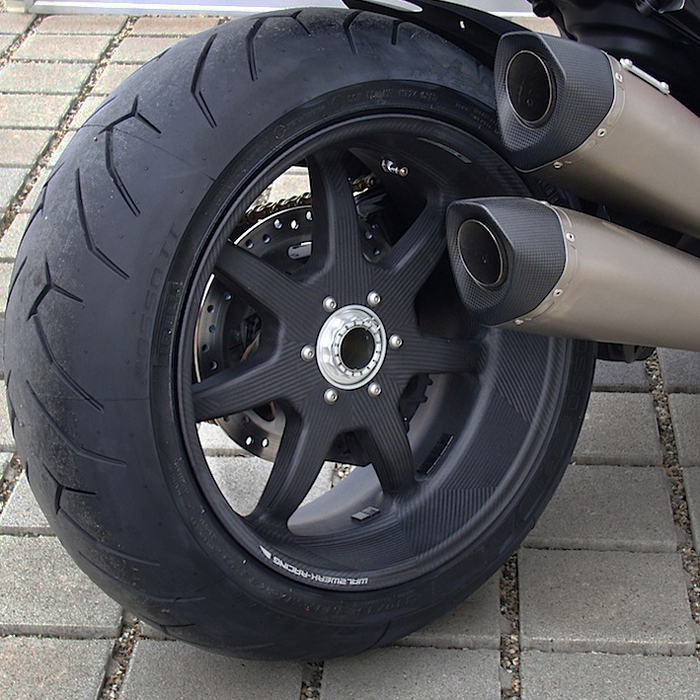 In particular, the reduced gyroscopic effect allows for much faster directional changes, which makes the motorcycle far more sensitive to the rider's demands. yield the biggest transformation over the stock bike. With less unsprung weight, the bike has a much lighter feel and takes minimal effort to turn"
"In just three reasonably clear laps on the BSTs I’d equalled my best time on the stock wheels, and then cut a second on each of two successive laps. Not only is that an incredible leap in performance, it also suggests that there’s more to come. You don’t arrive at your absolute best in one-second chunks. 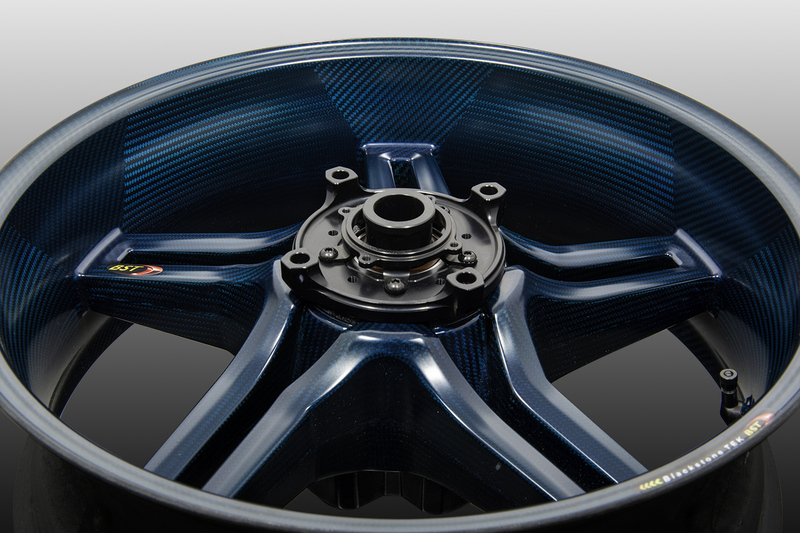 With an empty track, the BST wheels could be up to three seconds a lap faster. Best of all, the time comes effortlessly." "Thank you for my wheels; what can I say not only are they beautiful to look at, but they have totally changed the way my bike handles and feels. Everything has been improved, including my riding. A massive thank you."  Corner fatigue test standards exceeded, as specified in BS. AU. 50.  Radial fatigue test standards exceeded, as specified in BS. AU. 50.  Torsional fatigue test standards exceeded, as specified in BS. AU. 50. "Straightaway, the Yamaha felt faster on the carbon wheels …on the stock wheels under heavy braking the bike felt like it was trying to back in – no such problem on the lighter wheels. ‘What I found most staggering was the ability to correct a line mid-turn and that gave me more confidence to lean further even though it was starting to rain, there was far more engaging feedback from the carbon wheels. definitely want a set of these and, if I was racing, I’d certainly have to find the money somehow." 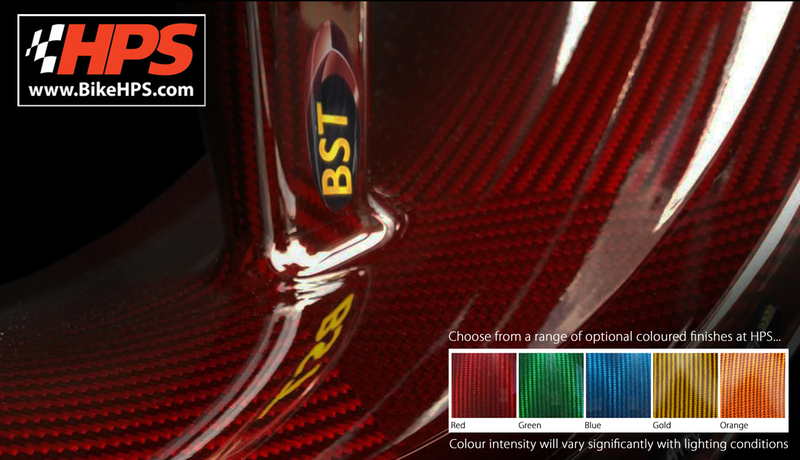 HPS is the exclusive UK importer and trade distributor for BST wheels. Dealers, please call for prices and information. CALL 01773 831122 TO ORDER YOUR WHEELS TODAY! The intensity of the colours varies significantly with lighting conditions and the colour only becomes apparent in brighter light. *All offers are subject to availability and HPS terms and conditions of sale and may not be used in conjuction with any other offer or discount. Images are for display purposes only. Prices are in UK Pounds Sterling (£) ; however, they may fluctuate and we therefore reserve the right to amend them without notice. Prices exclude delivery options which can be specified at the customer's request. All motorcycle dealer/manufacturer's trademarks acknowledged. Calls may be recorded for training/security purposes. All rights reserved. E.&O.E.